What is the difference between a vampire movie and a cannibal movie? They both set out to accomplish the same thing, just in different ways. On the one hand, vampires are drinking blood to sustain life. On the other hand, cannibals eat flesh for the very same reason. This is the question that baffled me all the way through Ravenous. The story takes place during the Mexican-American war. A high ranking officer (Guy Pierce) abandons his men and plays dead only to find himself overtaking the enemy. Having been called out on his cowardice, he is transferred to a base in California. The base has only eight people and is in the middle of nowhere. One night, a stranger (Robert Carlyle), comes to the base with an incredible story. He claims that, while moving westward, he was forced to eat the members of his party by an evil Colonel. The soldiers at the base decide to go see if there are any survivors-the stranger says there are a few-, but when they get there they are ambushed by the stranger, who has killed all the people in his party, not the colonel. The rest of the movie I will not reveal because this is a movie that needs to play out in front of you. There are some things that happen that we do not expect and some that we do. The beauty of this movie is that it is about the characters and how they react to the situation at hand. The movie was directed by Antonia Baird, who is a vegetarian, and has a sense of the disgust that the main character is feeling when he sees people eat meat. Pierce and Carlyle are very good here, each giving the exact opposite performance to each other. I know that it usually works that way, but here they are exact opposites. The debate I had going with myself about vampires vs cannibals stems from the fact that blood plays a key role in this movie. The lead characters inadvertently drinks the blood of his dead fellow soldiers and gets his strength back. This is a clear cut case of vampirism. But at the same time, the characters talk about how eating someone's flesh gives you power. It is shown in the movie that characters who ate other characters heal faster. This to me is a clear cut case of cannibalism. The question I have now is: Why can't this movie be both? We have had crossover movies before, why not this one? 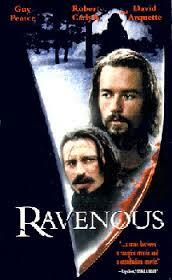 So Ravenous is a cannibal movie with vampire undertones. I like that.